On Saturday, a piece of aviation history was made. The Stratolaunch performed its maiden test flight above the Mojave Desert in California, some eight years after it was conceived on paper. The catamaran-style plane and company was envisioned and founded by late Microsoft co-founder Paul Allen, who died in October 2018. 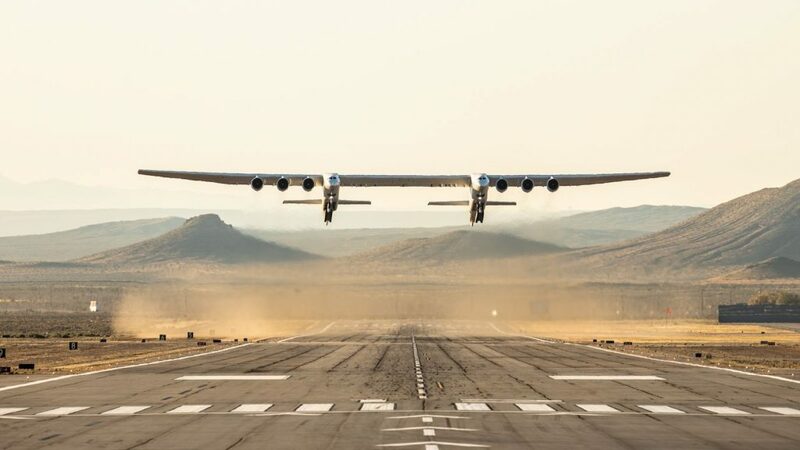 Designed to provide rocket-propelled satellites an airborne launchpad some 35 000 feet above sea level, the plane also boasts the longest wingspan of any aircraft on earth, at 117 metres. Said satellites will be mounted to the centre reinforced section of its wing. During its test flight, it hit a top speed of just over 300km/h at a flight level of 17 000 feet. The flight itself lasted two and a half hours. The Stratolaunch also performed “a variety of flight control maneuvers to calibrate speed and test flight control systems” as well as simulated landings. While the test flight may not sound all that impressive, other numbers make the Stratolaunch one intimidating bird to fly. While it isn’t quite as long as the Boeing 747-8 or the lone Antonov AN-225 — two other iconic planes known for transporting passengers and heavy equipment respectively — it has 28 wheels on its landing gear, and is powered by six Pratt & Whitney turbofan engines. Notably, the plane itself consists of repurposed Boeing 747 parts. And ridiculous still is its maximum takeoff weight: 590 000 kilograms. That’s nearly 200 000 kilograms more than the 747’s maximum takeoff weight. The Stratolaunch will need that muscle though transporting satellites and rockets into orbit. However, that milestone is still some time away. The company hopes that by 2022, it’ll make its first commercial satellite-shipping flight. Until then, we’ll have plenty of time to marvel at aviation’s new massive unit.